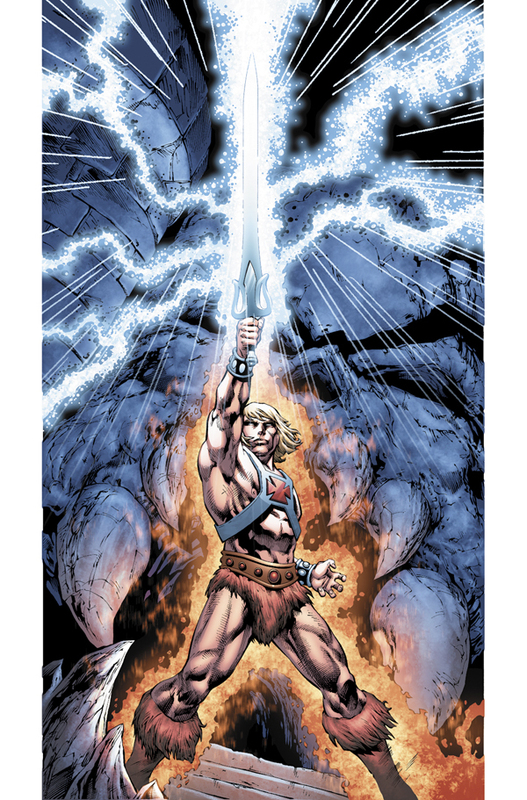 In July 2012, Masters of the Universe returns to comics again thanks to publisher DC Comics and creators James Robinson, Philip Tan, and Ruy Jose. 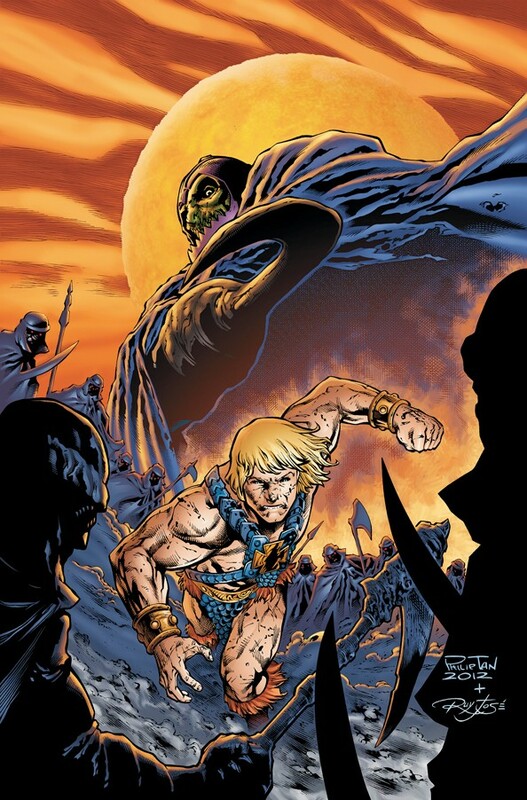 In the story, He-Man’s nemesis Skeletor has discovered a way to alter reality where he has become the ruler of Castle Grayskull and the Masters of the Universe have no memory of their past lives. Prince Adam, now a simple woodsman, has vivid dreams of being a sword-wielding hero, dreams a mysterious Sorceress tell him to be what should have been. It now falls on Adam to regain his power and stop Skeletor. The history of He-Man began when toy manufacturer Mattel wanted to develop a toyline based on the Star Wars films, which later resulted in trying to create a line to compete against these figures when the license went to rival Kenner. 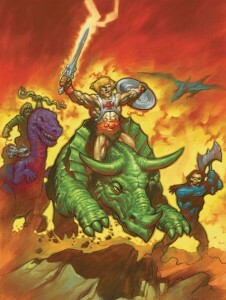 Developed by designer Roger Sweet, he crafted three He-Man prototypes with executives picking up the barbarian figure to base this new line upon. Combining elements of Conan the Barbarian, John Carter of Mars, and DC Comics’ Captain Marvel, the united efforts of toy designers, mini-comic creators, and the American animation studio Filmation provided a rich, alien world of sword, sorcery, and science fiction. 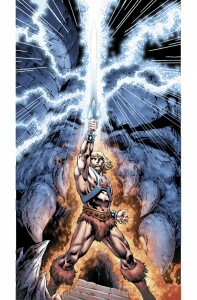 As the story of He-Man has changed through the various media he has been adapted for, the basic premise that generally crosses these mediums is that Adam, prince of the planet Eternia, must wield the powers of Castle Grayskull via its artifact the Power Sword to become He-Man, protecting Eternia and Castle Grayskull from the villainous sorcerer Skeletor who seeks to usurp these powers for himself. Aided in Adam’s quest is the Masters of the Universe, generally residents of Eternia that wish to maintain a free society where its various peoples govern themselves but work together in times of need under the banner of King Randor. Some of these individuals include Randor’s right-hand man Duncan, known as the Man-at-Arms, the Captain of the Royal Guard (and Duncan’s daughter) Teela, and the court jester and wizard-in-training Orko (who hails from the planet Trolla). Adam acts as He-Man in secret, his dual identity known only to Duncan, Orko, the Sorceress of Castle Grayskull that passed the powers on to him, and his pet tiger Cringer (who is transformed, by the same process that turns Adam into He-Man, into his noble steed Battle Cat). Skeletor is of course not without his own soldiers, notably the witch Evil Lyn, ruler of Eternia’s many great monsters Beast Man, the ravenous cyborg Trap Jaw, the three-eyed swordsman Tri-Klops, and master of the monsters of the ocean’s deep in Mer-Man. Based out of the terror-inspiring Snake Mountain, former home of Eternia’s Snake Men, Skeletor has schemed for years how to conquer Eternia which has often seen him seek the power of Grayskull (along with other villains like Hordak and King Hiss). It’s this basis that has formed the majority of the struggle in the Masters of the Universe series. He-Man and the Masters of the Universe has involved the use of comic books since its inception, with the action figures packaged with mini-comics (one such creator to work on these books being the legendary Bruce Timm). Soon after, He-Man’s adventures would make the leap to traditional comic books published by companies like DC Comics, Marvel, and MVCreations for Image Comics and CrossGen (new mini-comics produced by Dark Horse for 2012).